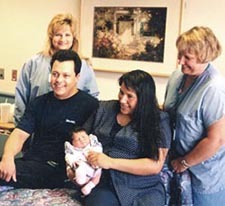 The Family Birth Center, a department of Battle Creek Health System, is located on the 4th Floor of the Inpatient Hospital on the Main Campus. The center features private, spacious family birthing suites – complete with jacuzzi baths. With over 1,400 births a year, the staff of obstetrical and neonatal nurses, your doctor, a Special Care Nursery onsite, and other support professionals, provide the highest quality obstetrical services. Visiting hours are 11:00 a.m. – 8:00 p.m. for your guests. The designated family member/coach is welcome 24 hours a day.